Kremlin on support to Syrian rebels: Please do not cling to meanings. 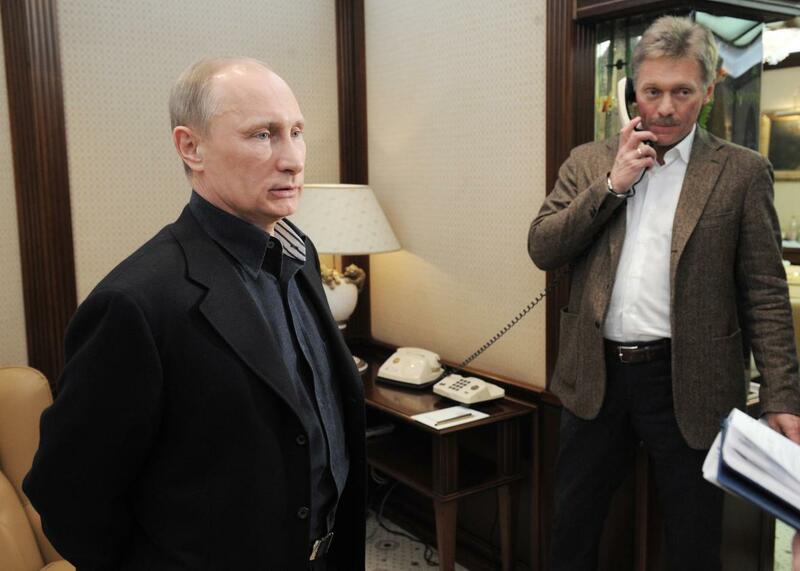 President Vladimir Putin with spokesman Dmitry Peskov. Peskov was discussing his boss, Vladimir Putin’s, suggestion earlier on Friday that Russia is now supporting the Free Syrian Army, the main internationally backed rebel umbrella group fighting against Bashar al-Assad, providing it with air cover, arms, and ammunition to fight against ISIS. The question of “legitimacy” is a key one as we get deeper into the internationally backed negotiations aimed at ending the fighting between the Syrian government and non-ISIS rebel groups. One sticking point in the talks has been which armed groups would be allowed to participate. That would appear to make the talks a nonstarter: There’s not much to negotiate if the Syrian government won’t negotiate with any armed rebel groups and will never agree to the opposition’s demands that Assad step down. The two sides’ positions don’t appear to leave a lot of room for compromise or accommodation, but it’s still early in the process and after all, this is Syria: Please do not cling to meanings.